Everything is possible when you participate in the private lessons at MPA. After we discuss your particular needs, we provide the right teacher. Our private lessons are adaptable to your needs. Are you already an advanced producer and you only want to improve your live shows using Ableton Live? Already studied at an audio school, but are you still looking for the right knowledge to improve yourself? We can help you. Check out our team page to find the teacher that suits your needs. Do you want to follow one of our Course packages one-on-one with one of our teachers? You can! 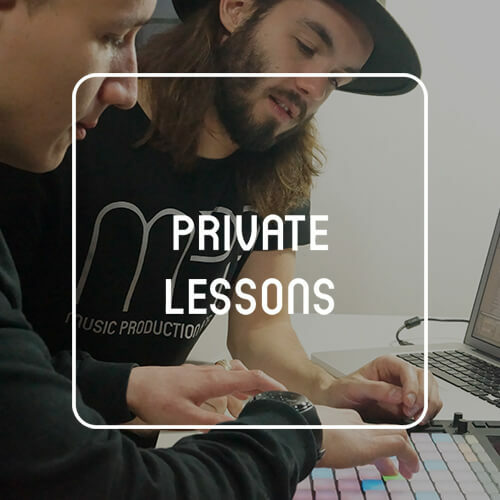 For 150% of the price, the Full Course, Hardstyle Course, Maschine Course and Producer Clinics can be followed one-on-one with the teacher. Extra discount options are possible if you follow a private course with a friend. Ask us for the conditions! As long as you follow classes at MPA on a regular basis, you will receive student extra’s. Including free studio time matching the amount of hours you take classes, free access to all of our events including guest workshops & masterclasses and discounts on software and hardware. The study load depends on the wishes and objectives of the student. During a free intake you can ask our teachers for more information about the study load.